But of course, there were all the other moments – much better ones – and so many of them. Like how it felt to watch my baby gently suckle to sleep, content, secure and satisfied. Or like how breastfeeding can instantly calm a cry, and soothe like nothing else I have ever known. There’s the way it helped heal a high temperature, and the sense of satisfaction from nourishing my baby – putting milky fat on his baby bones – all from my body. There was the regular relief I felt at let-down after a gap between feeds, and the comfort of dosing next to my son in the night as he fed beside me. There were all the long feeds in the early days which were so, so tiring – much more than I expected. But with them: cups of tea, feet up on the sofa and the television remote. There was the realisation that I was where I needed to be, doing what I needed to do, and nothing else. I’m so glad I was able to experience you, and though at times you were undoubtedly challenging, you were ultimately the easiest of options and regularly the quick fix I needed for my baby with no faff, fuss or expense. I know I am lucky that you and I worked out, I am fortunate because it isn’t always that way – no matter the hope and hard work. This journey has been an important and defining part of my life, and in many ways I will miss it. Thank you for the special moments, for helping me care for my baby, and for gifting me something that was unique to only me and him. It is over now, and that is right too. But I am happy it happened and I will cherish its memory. 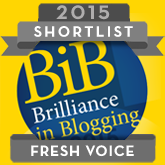 If you enjoyed this, I’d be really grateful for your nomination in the Brilliance in Blogging awards – Readers Choice category. You just need to click the badge below and complete the form by 7th June (Wednesday). It takes two minutes, promise! Thank you so much. You can also click here to follow the blog via my Facebook page. Thank you! Hope the last stretch goes OK. It’s such a funny feeling, isn’t it. Though I did feel fine after a couple of days, it’s just knowing I will never do it again!